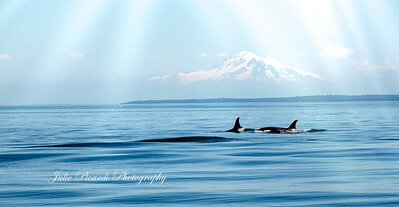 Peaceful, mystical, magical view of these great mammals. 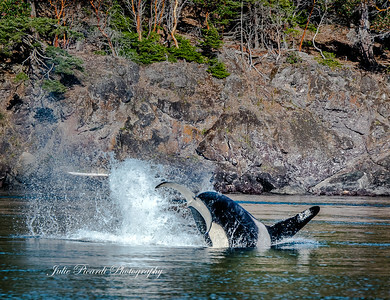 Joyful headlong dive of an Orca after a kill. 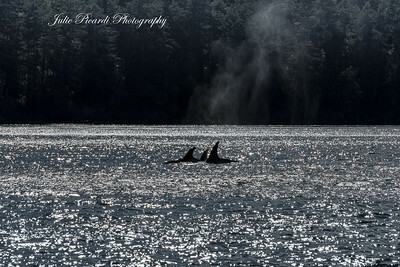 Transient Orca whales show their exuberance after feeding by tail slapping, breaching, and various other acrobatics. 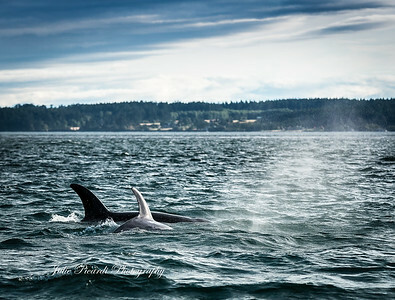 Transients differ from residents with subtle changes in their markings and coloration. 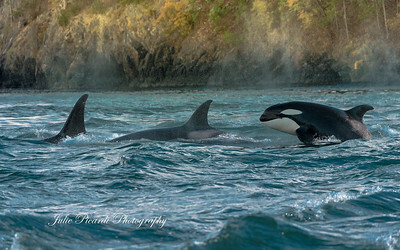 Here is a distinct color difference in a younger transient Orca whale. 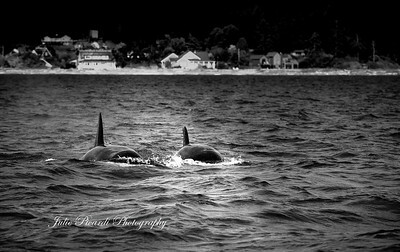 These two Orcas look like submarines headed towards their target. 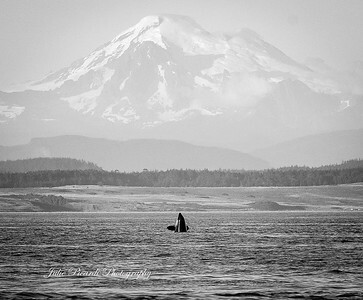 My favorite photo of the entire tour...transient orcas on the move. 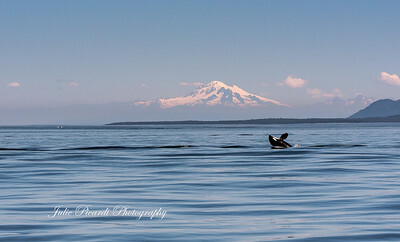 I was fortunate to capture this scenic shot....it's not easy to obtain a clear photograph of an Orca actually coming out of the water showing his beautiful markings. 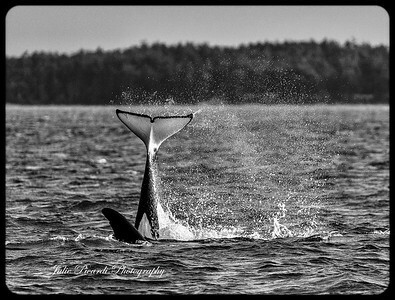 The seas are usually rough and the whales are fast and unpredictable. 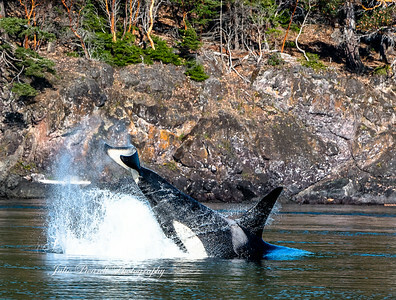 This Orca is "spy hopping", a term used to describe an Orca as it pops up straight out of the water to have a look around. 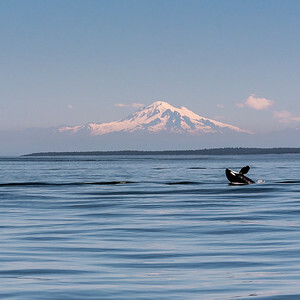 This Orca appears to be gazing at Mt. Baker, taking in all of its surroundings. What could be better than a glorious sunset?? 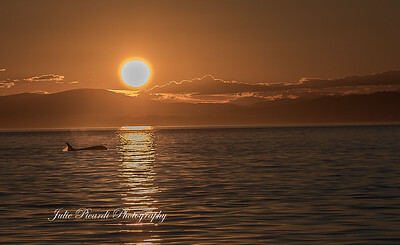 Only an Orca swimming through it. Nosediving for the pure joy of it! 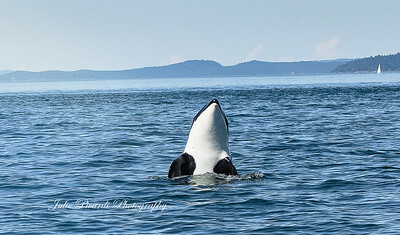 This Orca breached and dove head first into the water. Researchers aren't sure why whales breach. They speculate it could be for pleasure, communication, maybe even to clean their skin. Whatever the reason, it's an amazing feat to watch these huge animals perform their acrobatics. Beautiful form don't you think? Although not a terribly graceful landing. 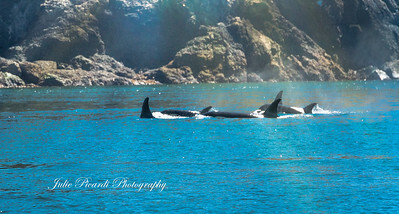 We saw this pod of 5 Orcas on the move, hunting for fish along the coast line. We felt thrilled to see a single spy hop which is fairly common with the resident Orca pods, but to see and capture a double was like ice-cream for the cake. Researchers say they perform this maneuver to have a better look around them. Could they be intelligent enough to coordinate this double vantage and communicate the results to one another afterward? 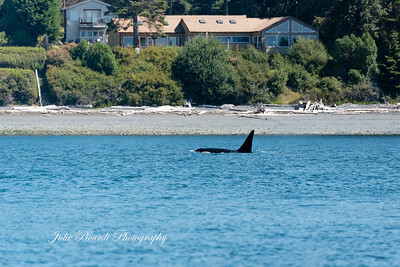 Spy hopping Orca near the coast line. Spy hopping in the middle of the Salish Sea. They are known to pop up anywhere and without warning. One has be to fast with the camera to capture the action. 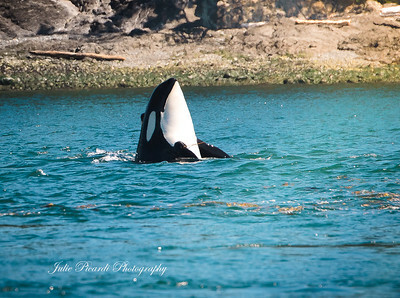 This Orca may be Granny, who is believed to be about 90 years old. 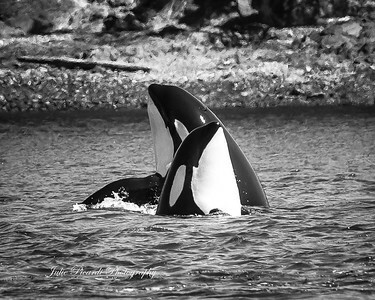 No longer reproducing, the researchers who follow her say she is a strong maternal figure within the pod hierarchy, often taking young whales who have lost their mother, under her "fins" for security as they grow and mature. 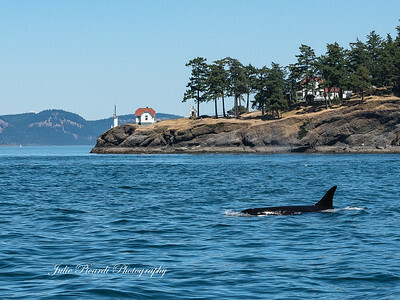 Orca swimming in front of the Orca Research house. So many little light houses dot the points on the coast line. 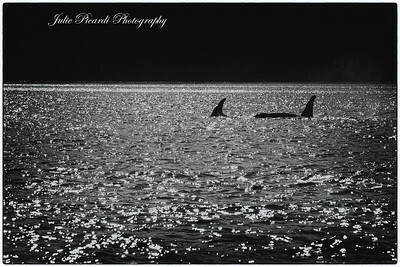 This one seemed idyllic with the Orca swimming in front. If you can imagine, Mt. Baker would be to your left if the photo were large enough. 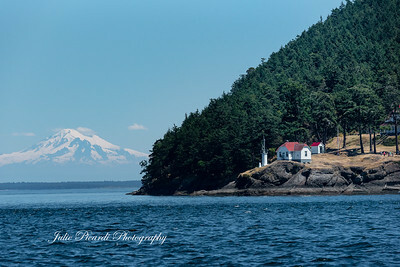 The only thing missing here is the Orca swimming in front of the light house . Mt. Baker pictured on the left. 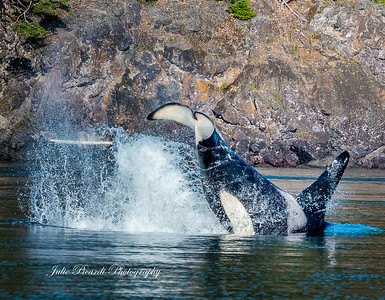 Researchers call this action a cartwheel...not exactly a breach, but still heaving up their enormous bodies out of the water....probably for sheer pleasure....and making a big splash. Have you ever seen such a tremendous fin? 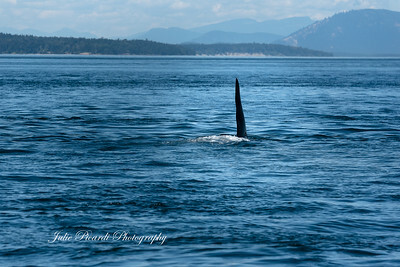 This must be the one we called "Big Mike", the largest Orca we saw on the trip. Kinda spooky seeing that big dorsal steaming towards the boat!